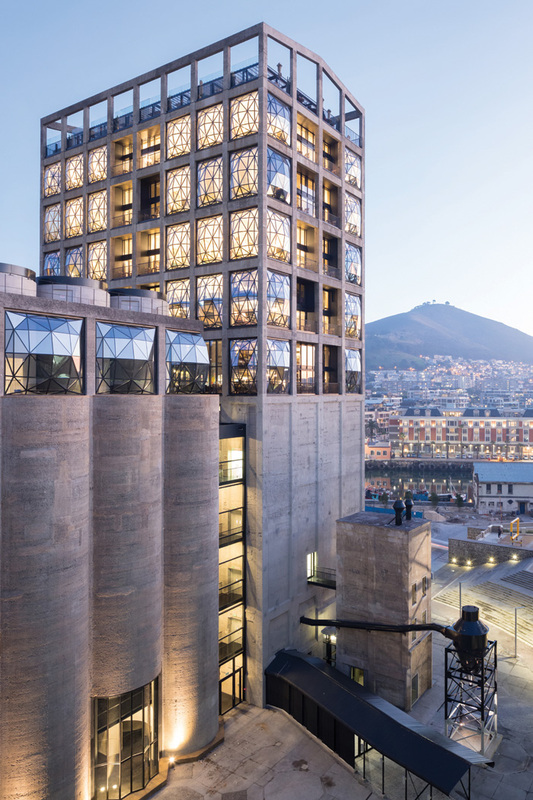 To the casual observer, Heatherwick Studio’s conversion of a corn storage silo in Cape Town is really about two grand gestures: one inside and one outside. One is exquisite and the other more quirky, yet ultimately enjoyable — unless perhaps you’re a die-hard modernist. 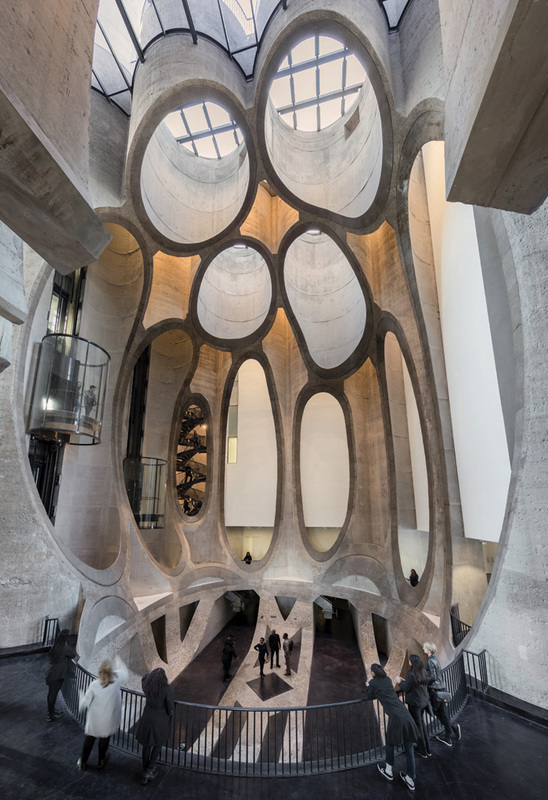 Heatherwick has been sniffing around the building for more than a decade, and over the past four years his studio has converted these two Twenties’ industrial buildings into Africa’s first major museum of contemporary art. The buildings — now united as one — also house a new hotel. 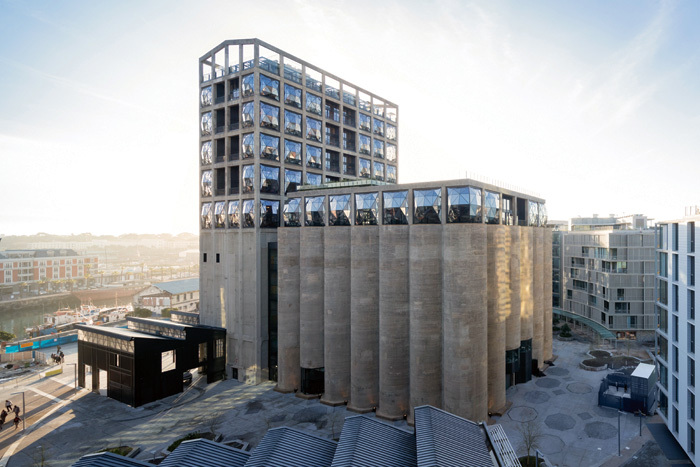 The gallery — Zeitz MOCAA (Museum of Contemporary Art Africa) — is also setting itself up as the guardian, the voice and the future of 21st-century art made by Africans in the broadest sense, including the diaspora of African artists. 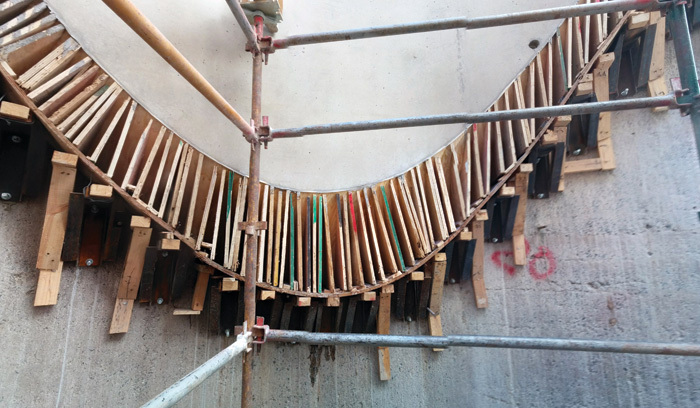 At the heart of this project is a piece of wow-moment Heatherwick magic that makes this an absolute must-see building. The larger of the two buildings, which are now joined by glass, consisted of 42 distinct, 27m-high cylindrical concrete tubes in a rectangle, seven tubes by six. From one end of this, Heatherwick has scooped out an ovoid(ish) space. The effect of cutting out curves through the cylinders is staggering: a dramatic cathedral-like atrium space has appeared. It towers around you majestically, inspiring the same kind of awe that medieval cathedral-goers must have felt centuries ago. But first, there is another grand architectural gesture — the one visible from the outside. 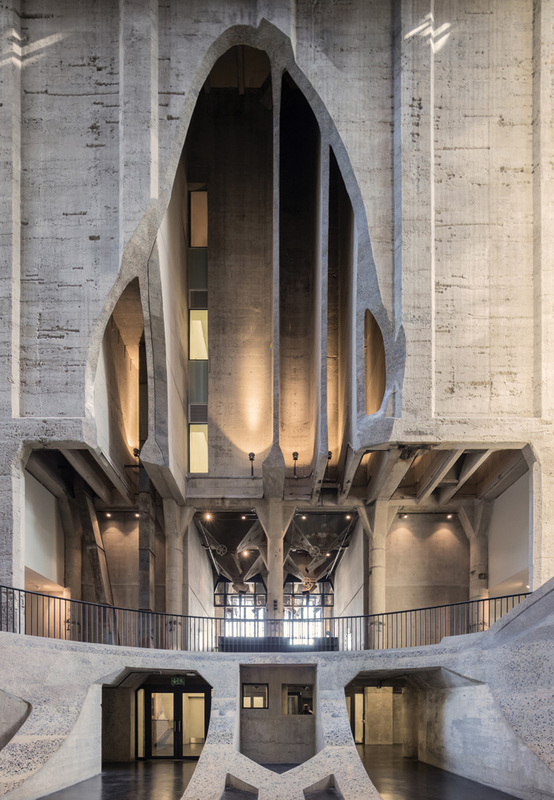 The silos themselves have been kept windowless, adding to the drama of the atrium and, on a more practical level, allowing complete light control for the 80 galleries that encircle and embrace its gothic heart. However, where the silos stop, a further floor with glazing appears. On the other building this continues up for a further four levels, topped off with an open frame. Where the silos are all curves, these crowning floors are subject to a sharply defined concrete grid. Inside the grid is glazing. So far, so good, you think for the modernists. The only thing is, the glazing is about as far away from the visions of Mies van der Rohe as you can possibly get. Every window bulges out of the frame like a bubble. It’s as though a giant glass blower has blown into the concrete frame and allowed the glass to ooze out freely. Then you look more closely — and you see that each of these convex windows is in fact made up of more than 50 separate panes of glass in a steel frame, making them more like an insect’s compound eye or even the gun turret of a Second World War bomber. The windows are mesmerisingly at odds with the rectilinear concrete they sit in. And these floors tower above the surrounding Waterfront area where the complex sits, not unfittingly perhaps like a lighthouse beacon — although this one is a lure, rather than a warning to stay away. It’s a tall building, though not particularly by modern standards; for half a decade after it was completed in 1921 it was the tallest structure in sub-Saharan Africa. And it has a monumentality, due in part to the lack of windows. Heatherwick Studio inherited a building covered in thick dull paint. However, when that was stripped off, a warm coloured concrete rarely seen today was revealed. ‘It was covered in magnolia paint, so we wanted to get back to the raw original structure,’ explains Thomas Heatherwick. ‘So we did tests and it looked great. It looks like it has sedentary layers, and the stones in it were actually quarried from Table Mountain. ‘We associate concrete with something quite hard and brutal, but here, what we found when we took off the paint, was something really soft, almost like adobe. It feels like you are at Petra [the ancient city in Jordan]. And in a way it’s like an extension of the work we did at Nanyang [The Learning Hub, Nanyang Technological University, Singapore, 2015] where we got interested in seeing concrete as a warm material.’ The Petra analogy is continued by the scarification on the surface, where protruding metal reinforcing was removed. It is particularly evident on the other more rectilinear building, where there has not been face-filling at all, there’s a hint of the hieroglyph. 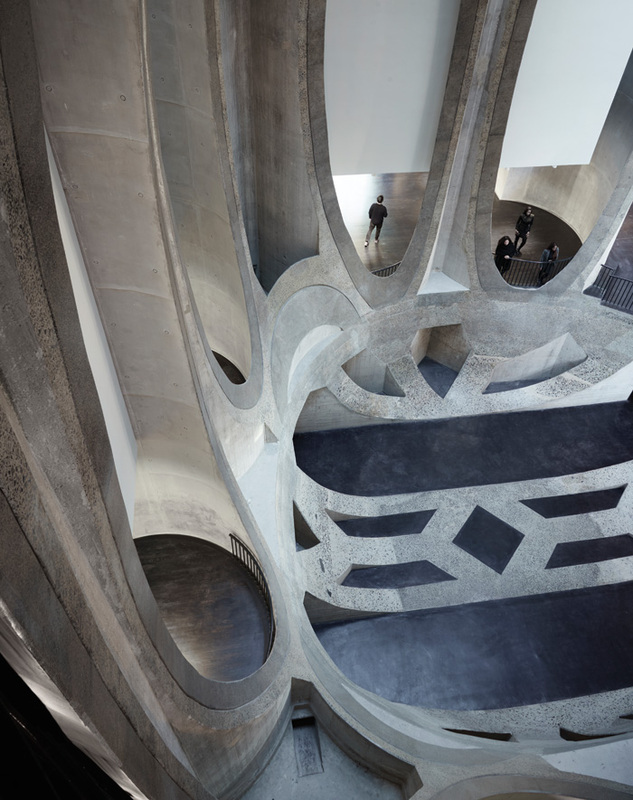 Heatherwick was introduced to the building in 2005, after he had been invited to talk at Design Indaba in Cape Town. 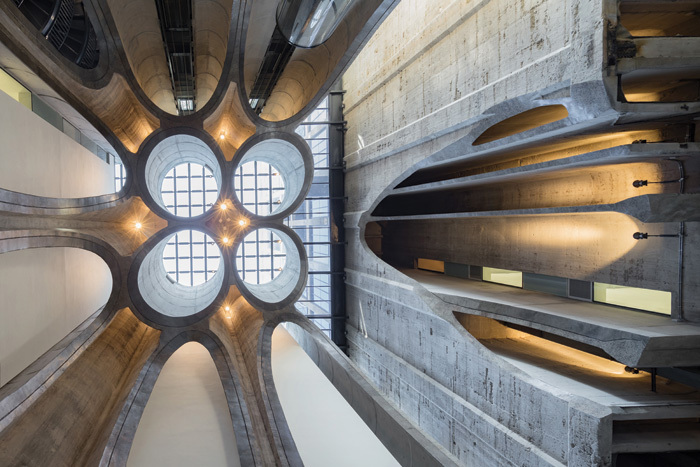 ‘There was this incredible structure that had been the tallest building in sub-Saharan Africa for half a century, but it seemed half of Cape Town didn’t know about,’ enthuses Heatherwick. ‘It had been hiding in plain sight because it was infrastructure. Half the people had never noticed it. ‘The building was made from so many tubes: circular tubes, square tubes, rectangular tubes, cruciform tubes, and there was never a space in it, unlike say a power station that might have a great space in it for turbines or the like. This was totally fragmented. We wanted to be able to create the grade-A kind of gallery space that was needed and also to create a “heart” that didn’t compromise this. And we didn’t want to lose the tubiness! We chose not to knock the building down because it exuded so much character, and is surrounded by that sort of sterility of new buildings that are always smothered in shiny cladding and surfacing that global procurement has driven in recent years. So in that context, something that had this level of texture and warmth felt like something worth cherishing. The tubes seemed like a blessing: 'If you were building a new building you could never justify this [gesturing towards the atrium]. So we had this cellular structure and we started by cutting a box out of it, but the tubes look too familiar. So then we tried a sphere and ovoid and that looked better, but something felt dead, too cold to us.’ He pauses, reflects, and contiunues: ‘It wasn’t truly interacting with the cellular geometry — it was too predictable. So we were searching for a logic that would drive something that wasn’t as familiar a form. Looking at the wider context, Heatherwick continues: ‘There was also this strategic need to reach out and create new audiences — and in a continent that’s as big as North America and Europe combined, where the cities fall over themselves to have contemporary art institutions, there’s not been a single major public institution for African artists to show their work. It’s also a continent that isn’t used to going to galleries. As for how they went about doing this, the story continues with group leader Matt Cash: ‘The challenge was the sleeving and the cutting. After having been through 86 iterations of the geometry, in the end, when we had the right one, we wanted to make sure that was exactly what we had! When we got into the building and started doing surveys we realised the building was slip-formed from 1921 and it is all over the place. A series of concrete sleeves was inserted into the tubes, which were tied together at the top to form an arch to move all the forces out and down. Arup was the engineer on the project. ‘We then started the demolition process by breaking out with a 20-tonne wrecking ball, until we got closer and then we started going down to smaller and smaller tools, like sculpting,’ explains Cash. ‘We had grand plans of thermal lances or waterjet cutting — all sorts of methodologies for doing the final cuts. Other than the wobbly nature of the building, there were a few more surprises, like finding out that it didn’t really have any foundations and was relying on its own weight. There was also the time that Heatherwick visited the site to find a huge hole at ground level, where no hole should have been. There had apparently been a plug of corn high up in one cylinder and when that dropped the pressure blew a hole in the side of the building. They turned this into a window at ground level and ultimately into the main atrium. Beyond the grand gestures, we mustn’t forget that this is a large gallery. 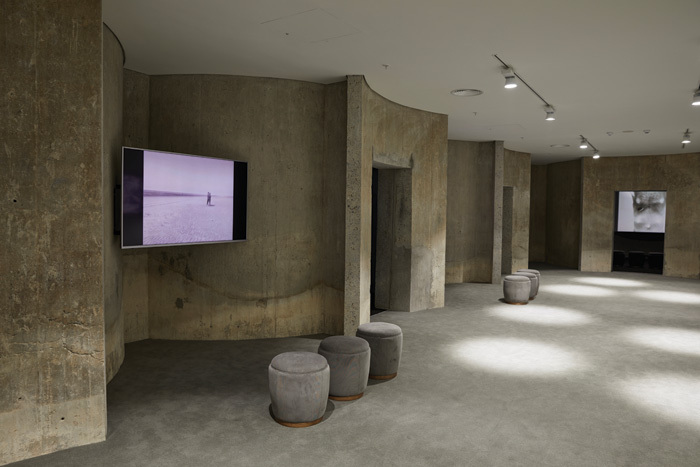 Surrounding the atrium, over nine levels, Heatherwick Studio inserted classic white-box gallery spaces. The tubes have been removed almost to the edges to create some 6,000 sq m of gallery space over the nine floors. The galleries encircle the atrium space in both buildings and as you move through these windowless galleries you find yourself emerging back at the atrium, which acts as a key wayfinding device. 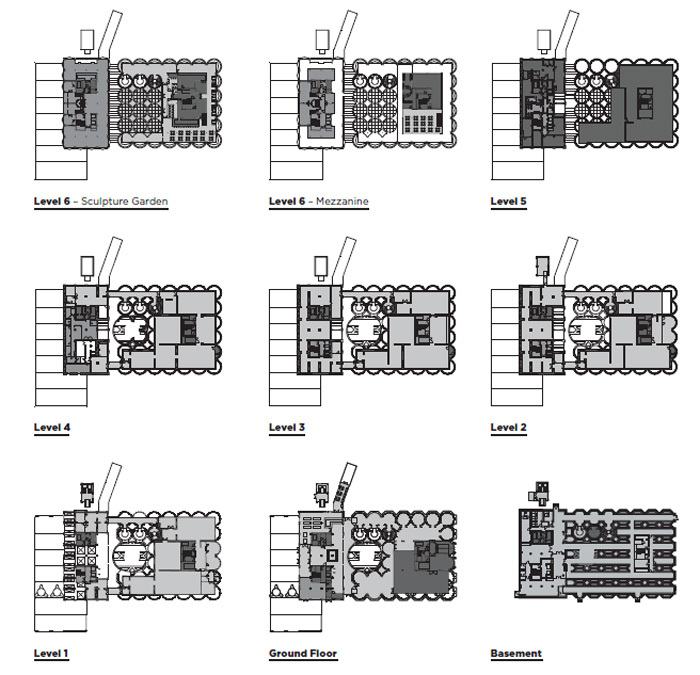 And it’s not only the physical realisation of this project that is interesting. 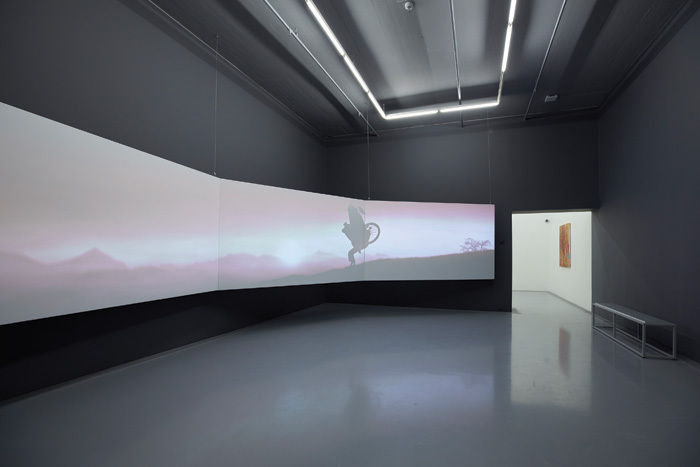 MOCAA has set itself up as the standard bearer for the presentation of African art, and as such it naturally is in the spotlight. A contemporary public gallery in Africa is unlike a contemporary art gallery in Europe or the USA. For one, as mentioned, there is little precedent. The funding is also completely different. There is no history of governmental funding for such a project and there is also no philanthropic tradition — which drives the American model. This project has been privately funded by a public company — the Victoria & Alfred Waterfront Holdings, within which it sits. The V&A is a redevelopment of the dockyard area, which has become the country’s third largest attraction with 24 million visitors a year (it is at pains to point out that 75% of those are locals). The press conference for the launch featured an unusual mix of delighted congratulatory whooping (you don’t get that at the Tate or Broad launches) and prickly questioning, as to why the first Pan-African public art gallery was opening here and whether it would really be accessible to all; the unspoken (African) elephant in the room being whether this is really for the majority black population of Cape Town, South Africa and the wider continent. V&A CEO David Green fielded the question matter-of-factly, saying that it was opening in the development because it was prepared to put in the money — £30m — and give over the building to this new not-for-profit institution. Black artists and curators at the conference added their positive voices, saying it was a watershed moment in the history of black art in Africa. After the conference, Green spoke to Blueprint about how and why V&A got involved and how it had been very careful to deliberately address the perceived issues, particularly through entrance pricing, with concessions and free days. ‘We were very conscious that the government would not do this and in fact they would be criticised if they were seen to be doing something that was perhaps perceived as a rich white people’s pursuit.’ V&A doesn’t use its full name of Victoria & Alfred (yes, Alfred, one of her sons) anymore as it smacked too much of colonialism. 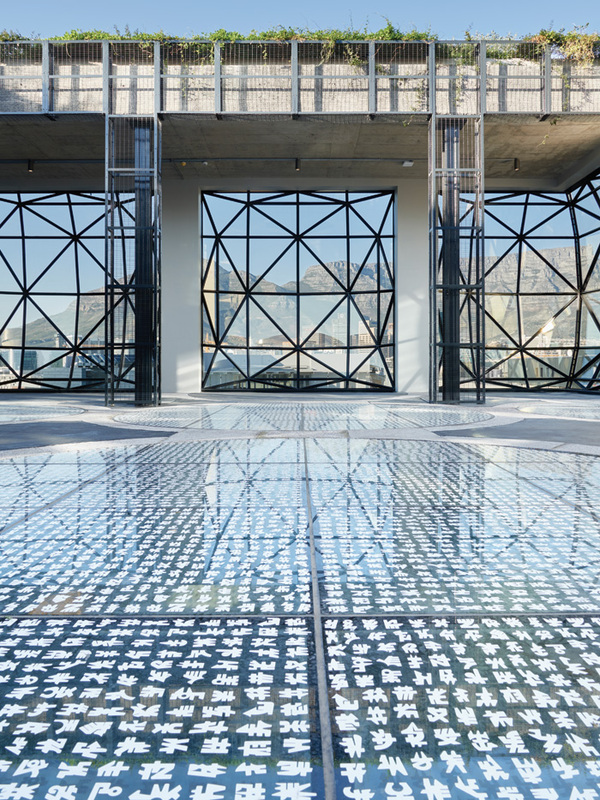 Zeitz MOCAA executive director and chief curator Mark Coetzee added another layer: ‘Remember that most of the public museums in this country, because of the history of apartheid, were not accessed by most people. So we had to find a way to guarantee access and that’s not only financial, it’s also about content, how the building works, making sure that representation of each community is in the building. 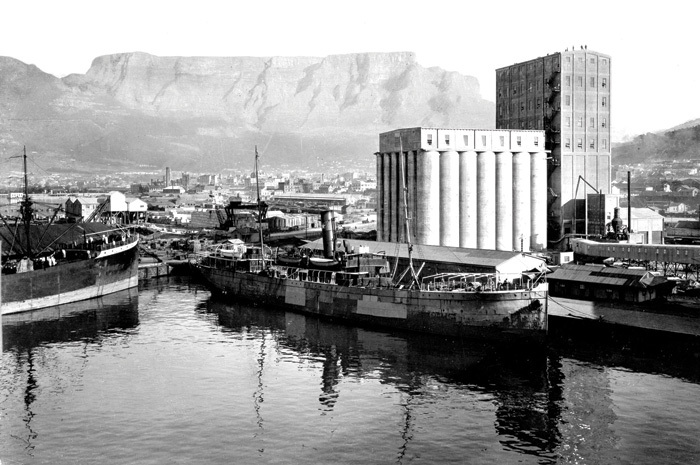 So that’s the story of Zeitz MOCAA: the building, its conversion and its lofty aims. It’s a strange building for sure — but it’s an enriching one on many levels and it certainly deserves to succeed and prosper.